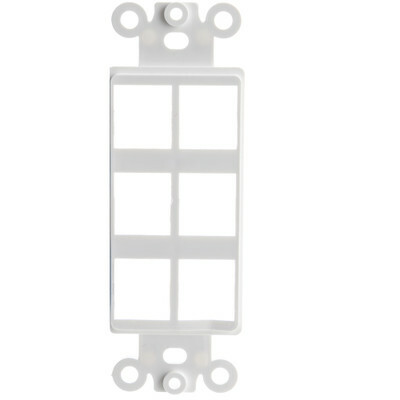 This quality 6-hole or port keystone Decora wall plate insert is an ideal companion to use with Decora keystone wall plates. Our superior wall plate insert is available in a clean, bright white color. This wall plate insert will work with snap-in keystones - however, it should be noted that these wall plate inserts have space restrictions. Keystone jacks that are wider than 18.5 mm are not guaranteed to fit side to side. This product comes with a lifetime warrantee and live support online is always available at CableWholesale. Good product. Strong and sturdy, keystones fit perfect.